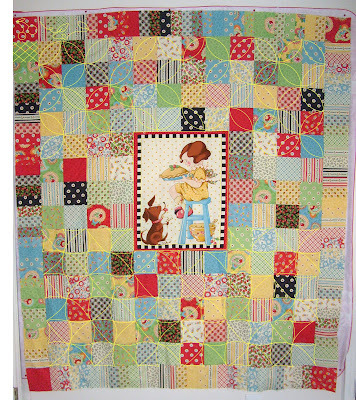 This is a surprise quilt for someone very deserving. I don't know if they read this blog or not so I can't mention who it is for. It is a "joint venture" between a good friend (can't mention names) and myself. The top has been pieced by my friend, I think she did a super job, and I get to do the quilting. Yes I know this looks very much like my daughter's quilt I've posted before (here.) That's because we fell in love with the fabrics, found a great deal on them, and ordered them at the same time. We thought the fabrics were very cheerful, bright, and perfect for our recipient. I'm a little anxious about the thought of doing the quilting on such a special quilt. I really want to try something different besides stippling or quilting it in the ditch. So I snapped a picture and imported it into Illustrator so I could "try out" a couple of quilting motifs before actually committing to thread. The top half of the quilt was drawn out with a "pumpkin seed" motif, and the bottom half was done in a quasi pinwheel motif. I think I have fallen in love with the pumpkin seed motif. I love the way it forms circles and flowers at the same time. I'm still undecided on what to do with the borders, I think I might do the borders in the ditch or echo just slightly to the inside of each "piano key." I'll definitely stick to the free motion cherry on each corner block. Oh yeah, I'm trying to get this done within the week! Yes, including the binding. Yikes! I also need to figure out what I'll be using for the backing so I can get started. Wish me luck and stay tuned for progress pics! That is so lovely! I am sure your friend is going to love it! You have your work cut out for you!!!! WOW! I cannot wait to see the backing too!